Home » Events » Most Splendiforous Giveaway Post!!! Wow – over 4000 likers on my Facebook page?! I am so honoured to be able to share my obsession love of fiber with so many people. The whole thing is sometimes a little like a runaway train, I dont know where its heading but I am happy to be on it with so many friends. And its such a great enabler, I really like this technology and its ability to shrink the world and put us in contact with each other so effortlessly (well on a ‘good’ facebook day anyway!). It allows me to share ideas, get feedback, its a mutual inspiration source, and the fiber eyecandy found online often leaves me speechless, in a good way. So to celebrate this new landmark in community I would love to share my newest project with you! There will be TWO CHOICES in this giveaway, because although I find it difficult to admit, I am aware that not everyone spins or wants to spin, and I dont want you to miss out 🙂 So one choice is for spinners and fiberistas, and the other choice is for people who love to knit or crochet or even felt! Did you all see the big trend right now with the blending boards? To make art rolags to spin from? Of course you did, if you have the internet you cant have missed it! Theyre awesome right. Well coming soon I will be making blending boards for sale, hand painted and decorated by me and using the excellent quality Louet Carding cloth! 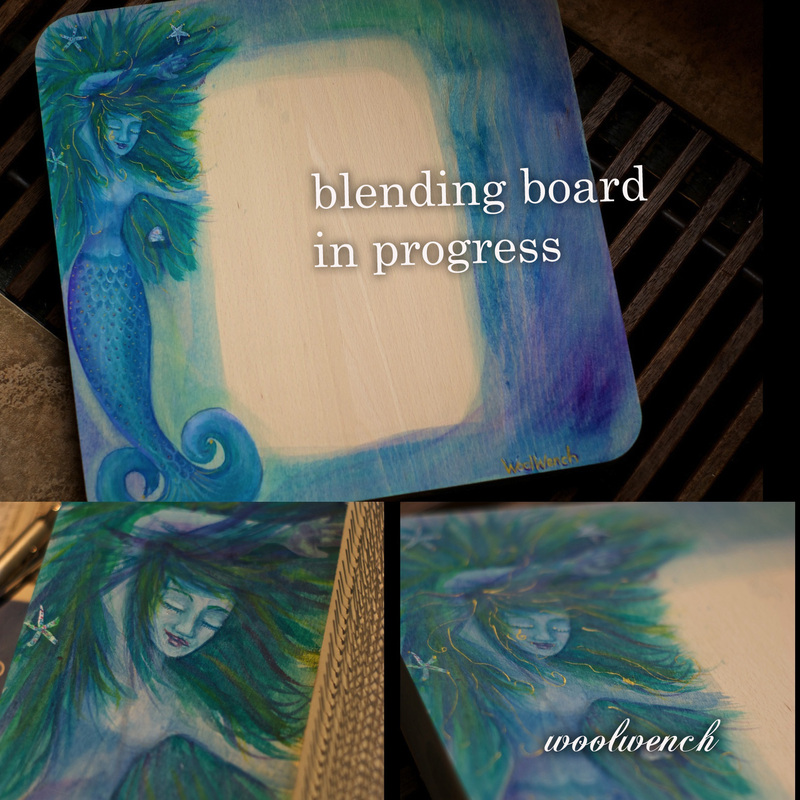 So my giveaway shall be one of my first hand painted WoolWench design blending boards!!! These are a combination of two of my all time favourite things, fiber stuff and painting. I cant wait to get them made and using them and in my shop! So to enter the draw!! Leave a comment here, share the post, tell me what you love about wool and what you like to make with it 🙂 Lets celebrate! Check back in a week and I should have pics for you of the finished boards, including the giveaway prize 🙂 Also, keep it in mind, if you dont win but you do live in or handy to Holland, Patty and I are going to be running a DIY blending board workshop where you can make your own and share my paints, you’ll get your own board for much less than the cost of buying a pre-made one. Thats always cool huh. I will keep the giveaway open for two weeks, and will post updates as I build the boards. Remember to leave your entry on this page though ok? -Just a quick edit to say – the draw will be random and taken from the comments on this page, I use a WordPress plugin to choose the winner. I wish I could give one to everyone though! Edit 10 March – progress! That is so unbelievably gorgeous ~ awesome painting 😀 I would love to be entered in your drawing, you are such an inspiration! and also your generosity in teaching us new things such as using a blending board. These boards are gorgeous!! I had not heard about a blending board until your posting on Facebook, but now I feel I just have to have one… whether I win one or not! Having lovely things to work on just makes the work more… well…lovely!!! LOL! Do you have a video showing the blending board in use? 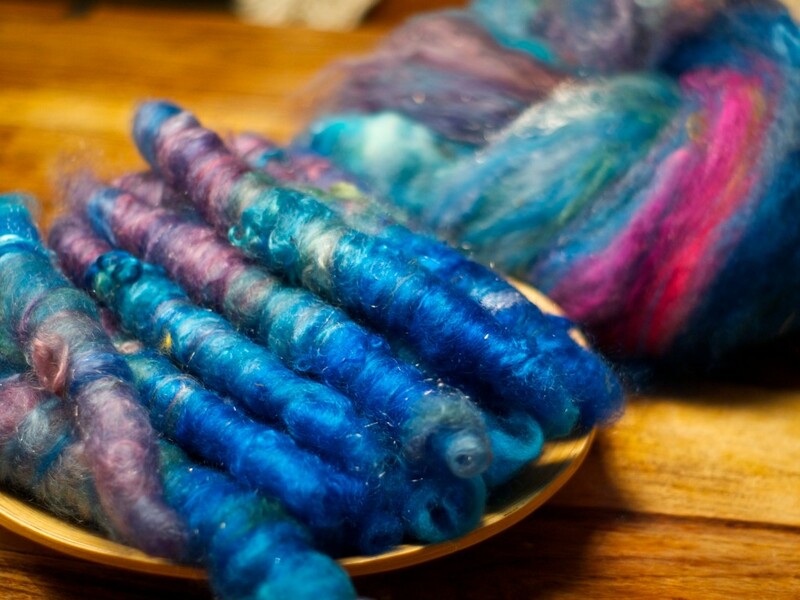 I love wool (and other fibers too) because it is used to create beautiful yarns. I blend fibers on my drum carder and I think it would be amazing to win a blending board to blend rolags. Especially one painted SO pretty! Thank you for the opportunity to win such an amazing prize. Your board is absolutely gorgeous! I enjoyed watching the video of it being created! Wow! What wonderful choices and decorations. Thank you so much for even thinking of such wonderful give-aways. Thank you for letting me enter. It is such fun. I am new to spinning and am looking for a wheel so I’m doing a lot of research now. I do a ton of knitting and crochet. I have been knitting since I was nine and have pretty much knit/crocheted every type and kind of project from scarves, hats, mittens and socks to clothing. All this activity has gotten me into more “quality tv time and books on tape. (I can go through about 15-20 books on tape in a week when I’m on a roll.) Thanks again for the wonderful opportunities. I love the way it feels! what an awesome way to celebrate! I think the art on the boards is so beautiful. I have a love of mermaids! I learned how to spin this summer and I also have a drum carder, but the rolags are so intriguing I’m going to have to have a blending board eventually. Happy birthday wishes to your son! I absolutely love these boards! My daughter is a retired Mermaid at Weeki Wachee Springs, here in Florida, what a perfect fit to my equipment, I have painted my wheel, combes and hackle 🙂 as I have been painting for over 20 years. I love processing the fiber from start to finish. Off the sheep to the finished product. It is such a grounding and relaxing part of my life. You did a GREAT job!!! Lovelovelove spinning and love to read your FB posts, sooooo inspirational! If I won the blending board, I would be swooning for sure! Thanks for all you do to promote this wonderful art! Happy 5th Birthday!!! I’m a newbie and on a mission to collect all of my fiber tools. You are inspiring! Hi, it’s Jama from Southard Farm. Love your work, admire your talents and thank you so much for sharing your creativity with us all. I raise a small flock of sheep and Angora goats, loving prepping their fiber for spinners…just never have learned to spin yet. Is it too late to enter your giveaway? Love your painted blending board! You have a lovely website and blog, and I like your FB page, also. I mostly make socks, but I’m having difficulty balancing my yarn. I think I saw somewhere that you have a book available on that very subject, so I’m off to look for it right now. Thanks. Wool is soft, wool is squishy. I love to hoard it, I love to spin it. I didn’t think I “needed” a blending board until I saw your beautiful paintings! Now I think I have to have one. This is so awesome. That’s the most beautiful blending board I’ve ever seen. I’ve beentrying to figure how to get a blending board for ages, and just saw yours and the news of your giveaway. It’s the combination of magic and simplicity that gets to me in fiber. So down to earth and yet inspiring. I just can’t get enough of it. I saw your painted mermaid board on Ravelry, and it is so beautiful. I was very surprised to see that you were giving it away! I would love to be in the drawing for this. I love spinning, hand processing fleece, blending different fibers and colors, and am interested in spinning fun yarns with more texture. I’m very excited about this new tool! Ohhhhh you are a wonderful artist. These are beautiful! I”m so inspired. I want one… it’s so perfect! Please please fingers crossed. Beautiful work… hey… maybe we can incorporate some sparkling gems in places in the art… as pretty as a Glindle 😛 Thanks for sharing so much of your art. I really want to learn how to make fiber cigars! But what do I love about wool? The never ending variety of colors and textures, and the soft comfort on a raw day. I want to make dreamcoats, but mostly I make scarf hugs. It’s the amazing natural properties of wool that I find fascinating. Being able to add the extra dimension of colour, texture and design to make something sustainable, practical & beautiful is what motivates me to create. I’m a relative newcomer to dyeing, spinning, designing & knitting so am only just moving on to bigger projects, having so far mainly made lots of scarves & hats. The sense of community and generosity of contributors, like yourself, online is uplifting and encouraging for all of us. So, thanks. What a wonderful talent you have in your painting. I would love to be entered in your generous giveaway. I am a very new spinner, but love it. I knit mainly accessories, hats, shawls, mittens. Although I have finished 2 sweaters and have plans for 2 more. Thanks again. Love the site.